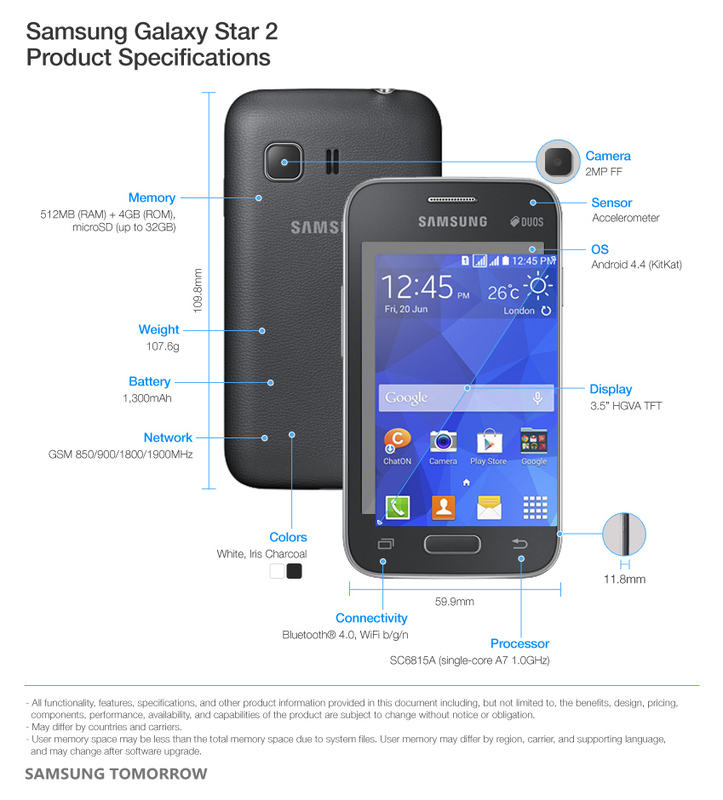 • Samsung announced Galaxy Core II, Galaxy Star 2, Galaxy Ace 4, and Galaxy Young 2, expanding its Galaxy line, for an exceptional smartphone experience at an affordable price. • All 4 New Galaxy devices are equipped with Samsung’s simplified TouchWiz Essence interface and the latest Android 4.4 operating system. 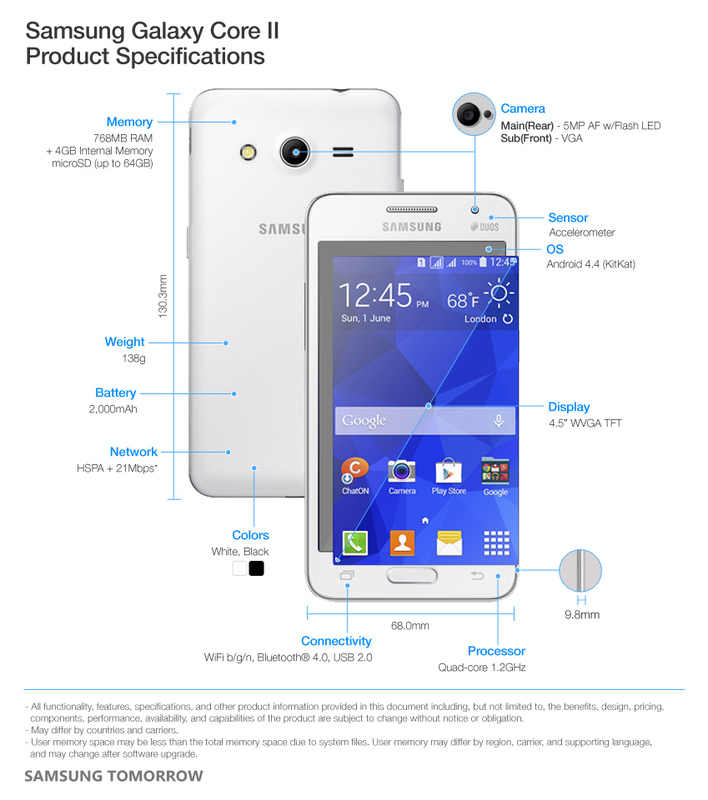 Samsung Electronics introduced the Galaxy Core II, Galaxy Star 2, Galaxy Ace 4, and Galaxy Young 2, offering powerful performance, intelligent features, and refined designs for an exceptional smartphone experience at an affordable price. The Galaxy Core II is the perfect device for users who want the optimal mix of style, portability, and power. It sports a refined leather-like back cover design and comes with a 1.2GHz quad-core processor to perform data intensive tasks with speed and ease. Activities are aided by a beautiful 4.5-inch display and long-lasting 2,000mAh battery for extended usage. The device also offers a 5-megapixel camera with LED flash, Samsung’s simplified TouchWiz Essence interface, and the latest Android 4.4 operating system. These features are supported with the Galaxy Core II’s Dual SIM technology, enabling users to more easily maintain their work-life balance. 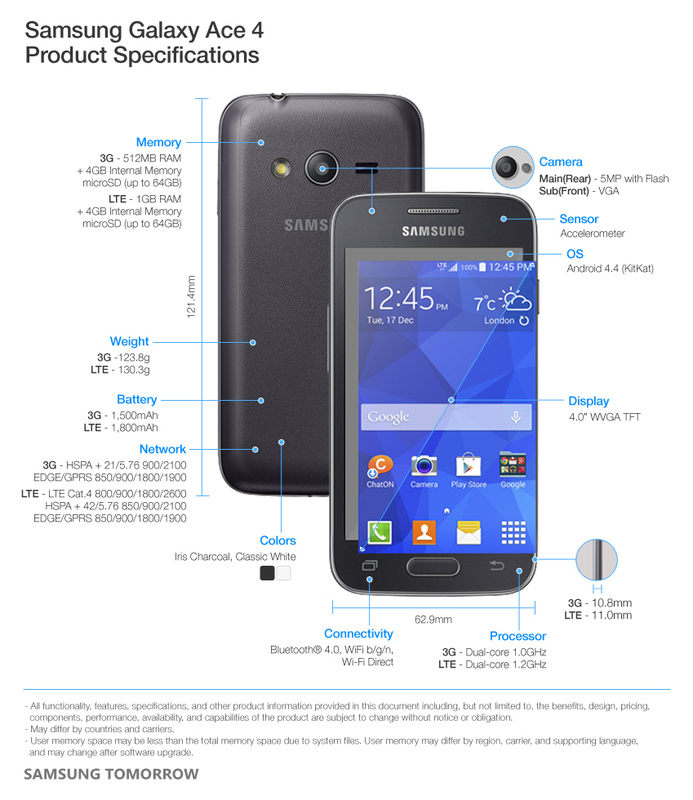 The Galaxy Ace 4 sports a premium design in a compact form offering comfort and portability. The Galaxy Ace 4 is powered by a 1.0 GHz dual-core processor with enhanced computing power for seamless performance and multitasking as well as a 1500mAh battery. Featuring the Android 4.4 operating system, users can enjoy the latest Android OS with new features such as wireless printing, quick office, and smart storage access. 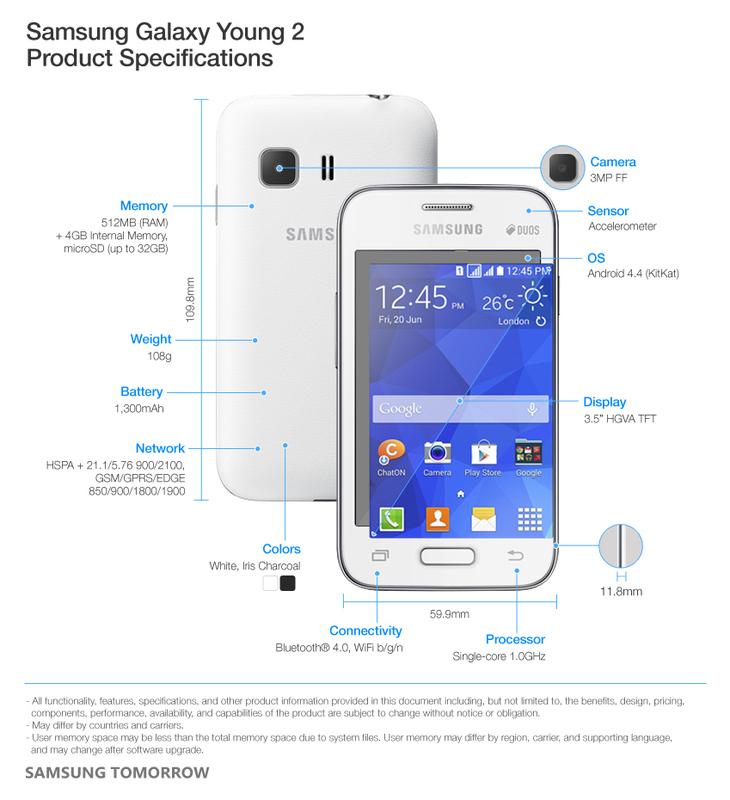 The Galaxy Ace 4 comes equipped with Samsung’s simplified TouchWiz Essence interface and enhanced camera UI, making it easy to use the device’s many beneficial features. Compact yet fully equipped with features, the stylish Galaxy Young 2 is an ideal smartphone for the user who focus on essential features and usability. Seamlessly powered by a 1.0 GHz single-core processor, the sleek device features a long-lasting 1300mAh battery, 3MP camera and an impressive 3.5-inch HVGA display, which provides a touch screen experience that is incredibly easy to use and navigate. The Galaxy Young 2 also offers Samsung’s user-friendly TouchWiz Essence interface, the latest Android 4.4 software, and the eight latest Gameloft games for an all-around enhanced and greatly enjoyable user experience. The Galaxy Star 2 offers a stylish and portable design that is small enough to use with one hand and easily fit in a pocket or small bag. The device sports a 1.0GHz single-core processor for powerful performance, smooth UI transitions, and fast internet. It also comes with a 2-megapixal camera and is supported by a 1,300mAh battery ideal for long periods of usage. Combining the latest Android 4.4 software experience with a user-friendly TouchWiz Essence interface, Galaxy Star 2 allows you to easily navigate the device. The Galaxy Star 2 comes with eight downloadable Gameloft games for users to enjoy on the device’s 3.5-inch HVGA display. * May differ by countries and carriers.